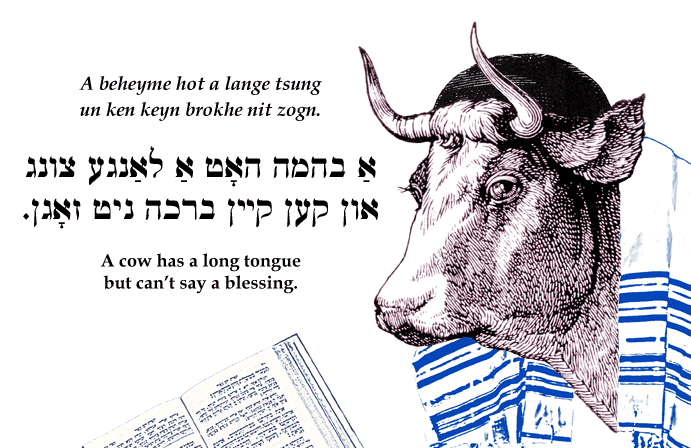 Yiddish Wit: A cow has a long tongue but can't say a blessing. אַ בהמה האָט אַ לאַנגע צונג און קען קיין ברכה ניט זאָגן. A beheyme hot a lange tsung un ken keyn brokhe nit zogn. A cow has a long tongue but can't say a blessing. SOURCE: Kogos, 1001 Yiddish Proverbs. A "long tongue" in Yiddish, like a "big mouth" in English, indicates that a person talks a lot.